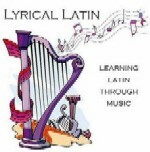 Lyrical Latin: Learning Latin Through Music CD has fifteen well-known melodies, with wonderful new musical arrangements. The songs, performed by vocalist CC Couch, are sung with words that teach Latin grammar and culture. Although this is not intended as a stand alone course, this CD can be used along with classroom or home schooling. Teddy Irwin, who has played with Petula Clark, Bette Midler, Jimmy Buffet and Doc Severinson, among others, scored and arranged all the selections. LeaAnn Osburn, classical language consultant, has been a Latin teacher for 30 years and is now an editor of Latin textbooks. She is the author of the lyrics along with David Pellegrino and CC Couch.